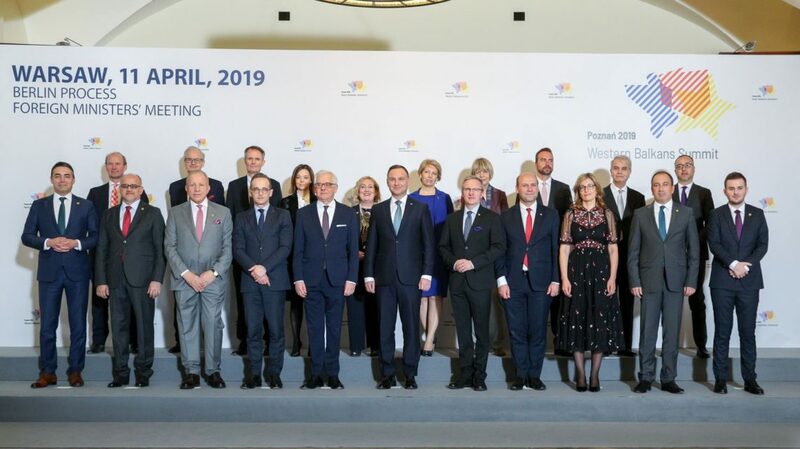 WARSAW – RYCO Secretary General and Deputy Secretary General Mr Đuro Blanuša and Mr Fatos Mustafa are participating the Berlin Process Foreign Ministers’ Meeting in Warsaw on 11 – 12 April where they are presenting the work of RYCO and the situation of young people in the Western Balkans. The meeting is organized in the framework of the upcoming Poznań Summit of the Berlin Process to be held on 4 – 5 July. The two-day meeting started with a working dinner hosted by President of Poland Mr Andrzej Duda at the Presidential Palace. The meeting’s participants discussed the situation of young people in the Western Balkans and the European Union with the focus on challenges young people are facing as well as the impact they should have on entire Europe. Mr Blanuša presented the so far achieved results of RYCO but also the latest data regarding the young people in the region. “The next decade will be decisive for the young people in the Western Balkans. A large majority of the region’s youth is in favor of solidarity-based Europeanization, they overwhelmingly support the EU membership, including the strong welfare state, but there are also signs of increasing authoritarian tendencies,” the RYCO Secretary General said. “It is up to the governments of the region, but also the EU and our partners in Western Europe to recognize this situation and take concrete measures in order to ensure positive perspectives for our youth and future generations,” Mr Blanuša underlined. Previously, Minister of Foreign Affairs of Poland Mr Jacek Czaputowicz pointed out that the meeting’s discussions will focus on reforms of the Western Balkans, especially in the context of the prospects for the young generations. “The absence of prospects causes the emigration of young people from the region and deterioration of social attitudes,” Mr Czaputowicz said. The meeting discusses topics related to the EU integration process of the region such as bilateral issues, but also the Polish presidency over the Process, its state of play and stakeholders’ expectations. RYCO Secretary General and Deputy Secretary General are also meeting a number of decision makers and stakeholders on the margins of the meeting participated by the Foreign Ministers of the Western Balkans and representatives of the EU members states participating in the Berlin Process.